I love the small red one and ohh the purple one is cute too!! might pop into miss selfridge after work to see if the length of the strap is long enough, I need a side bag so desperatly. i love the purple one!! 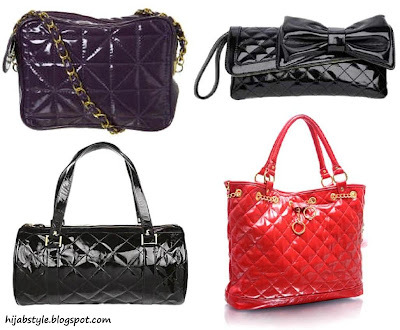 and am in love with the black bow one!! :) .. very gossip girl!! LOL I can't afford Chanel but I'd rather go naked than carry a fake one (and since I am a proud Muslimah and that's not an option....) I buy vintage. Not vintage stores because they charge a fortune, but often antique stores like Fort Street here in Victoria BC Canada. I got a real Chanel bag with a broken strap of leather in the chain for $60.00 CAD then I took it to a leather repair place (they usually do shoes and horse tackle) and ten dollars later after a fresh leather shine treatment and a new strap I had a better than new Chanel bag. 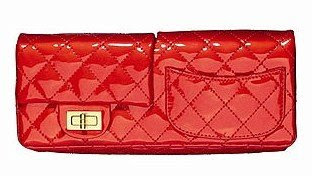 It is the quality you buy when you buy Chanel and LV so don't carry a fake. There's no point cuz you're just showing off. Love the ones you posted Hayah. They have the style but aren't pretending to be made of materials they're not. Actually, carrying designer knock-off sporting the label is a kind of stealing, so it something Muslimahs shouldn't do. What happened to many of my purse finds? Well, the girls at my sister's school used to pick on her, saying she was ugly (she looks Arab and I was a blonde so people sorted us into different groups of people which I hated-we were sisters after all---so I gave my cool designer finds to her. can you call the only girl in the school with a real Chanel purse a loser? They couldn't with their fake LVs. Could they tell her she was ugly when she walked into her prom wearing a real Oscar de la Renta ball gown? (Okay, so that wasn't a vintage find, but my Versace prom dress was---pre Muslimah days all). I hate how people can be so mean. That is why I love hijab and abaya. It makes us equal, but we can still be individual. Now those same petty mean girls WISH they had been y sisters friend, cuz she gets to fly anywhere she wants in the world at least once a year, and gets one free ticket for a friend to go with her. Good things happen to people who are good even to people who don't deserve it. Oh I love my sister. Thanks Hayah, for reminding me of the smile I managed to put on her face when I gave her a silly little handbag tp protect her from bullies. Jane, hope it makes up for the time I pulled you across the playground by your hair cuz you hit me with the swing! Alix: lol I ♥ your stories! Yeah I absolutely hate fakes, LV seems to be a victim of rip offs far too often. So trashy! I liked these ones because they're all different designs, but still have the quilted effect in common. $60 for a Chanel bag?! *faints* What a find! I have a looong holiday this summer inshallah, and I'll be stuck here so I intend on scouring London's charity shops and second-hand stores for those special finds. Will post about my adventures here inshallah!